The Zimmermann Telegram was a diplomatic note sent by the German Foreign Office to Mexico in January 1917 which proposed a military alliance between the two nations should the United States enter World War I (1914-1918) on the side of the Allies. In return for the alliance, Mexico would receive financial assistance from Germany as well as could reclaim territory lost during the Mexican-American War (1846-1848) (1846-1848). 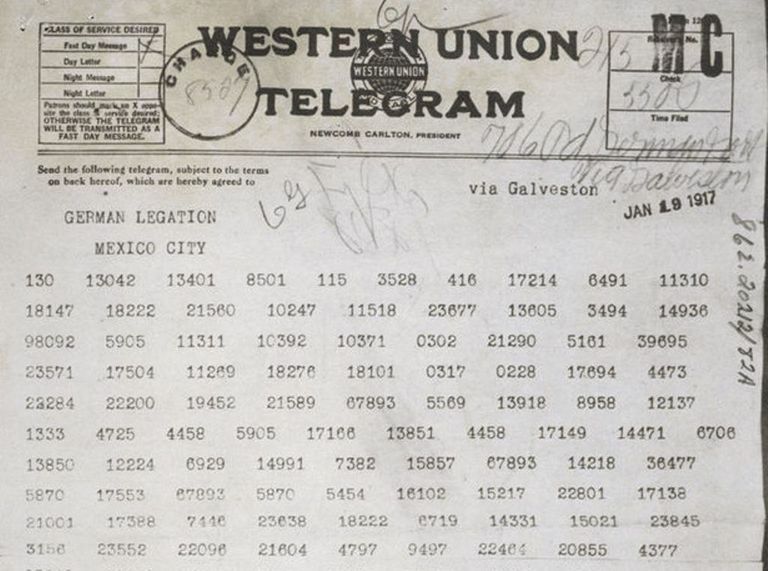 The Zimmermann Telegram was intercepted and decoded by the British who in turn shared it with the United States. The release of the telegram in March further inflamed the American public and contributed to the American declaration of war the following month. In 1917, As World War I ground on, Germany began assessing options for striking a decisive blow. Unable to break the British blockade of the North Sea with its surface fleet, the German leadership elected to return to a policy of unrestricted submarine warfare. This approach, whereby German U-boats would attack merchant shipping without warning, had been briefly used in 1916 but was abandoned after strong protests by the United States. Believing that Britain could be quickly crippled if its supply lines to North America were severed, Germany prepared to re-implement this approach effective February 1, 1917. Concerned that the resumption of unrestricted submarine warfare could bring the United States into the war on the side of the Allies, Germany began making contingency plans for this possibility. To this end, German Foreign Secretary Arthur Zimmermann was instructed to seek a military alliance with Mexico in the event of war with the United States. In return for attacking the United States, Mexico was promised the return of territory lost during the Mexican-American War (1846-1848), including Texas, New Mexico, and Arizona, as well as substantial financial assistance. As Germany lacked a direct telegraph line to North America, the Zimmermann Telegram was transmitted over American and British lines. This was permitted as President Woodrow Wilson allowed the Germans to transmit under the cover of U.S. diplomatic traffic in hopes that he could remain in touch with Berlin and broker a lasting peace. Zimmermann sent the original coded message to Ambassador Johann von Bernstorff on January 16, 1917. Receiving the telegram, he forwarded it on to Ambassador Heinrich von Eckardt in Mexico City via commercial telegraph three days later. After reading the message, von Eckardt approached the government of President Venustiano Carranza with the terms. He also asked Carranza to aid in forming an alliance between Germany and Japan. Listening to the German proposal, Carranza instructed his military to determine the feasibility of the offer. In assessing a possible war with the United States, the military determined that it largely lacked the capability to re-take the lost territories and that German financial assistance would be useless as the United States was the only significant arms producer in the Western Hemisphere. Furthermore, additional arms could not be imported as the British controlled the sea lanes from Europe. As Mexico was emerging from a recent civil war, Carranza sought to improve relations with the United States as well as other nations in the region such as Argentina, Brazil, and Chile. As a result, it was determined to decline the German offer. An official response was issued to Berlin on April 14, 1917, stating that Mexico had no interest in allying with the German cause. As the ciphertext of the telegram was transmitted through Britain, it was immediately intercepted by British code breakers who were monitoring traffic originating in Germany. Sent to the Admiralty's Room 40, code breakers found that it was encrypted in cipher 0075, which they had partially broken. Decoding parts of the message, they were able to develop an outline of its content. Realizing that they possessed a document that could compel the United State to join the Allies, the British set about developing a plan that would allow them to unveil the telegram without giving away that they were reading neutral diplomatic traffic or that they had broken German codes. To deal with the first issue, they were able to correctly guess that the telegram was sent over commercial wires from Washington to Mexico City. In Mexico, British agents were able to obtain a copy of the ciphertext from the telegraph office. Stunned, Hall initially believed the telegram to be a forgery but passed it on to Ambassador Walter Hines Page the next day. On February 23, Page met with Foreign Minister Arthur Balfour and was shown the original ciphertext as well as the message in both German and English. The next day, the telegram and verifying details were presented to Wilson. News of the Zimmermann Telegram was quickly released and stories about its contents appeared in the American press on March 1. While pro-German and anti-war groups claimed that it was a forgery, Zimmermann confirmed the telegram's contents on March 3 and March 29. Further inflaming the American public, which was angered over the resumption of unrestricted submarine warfare (Wilson broke diplomatic relations with Germany on February 3 over this issue) and the sinking SS Houstonic (February 3) and SS California (February 7), the telegram further pushed the nation towards war. On April 2, Wilson asked Congress to declare war on Germany. This was granted four days later and the United States entered the conflict.